Functionality and aesthetics - no compromise, but a synthesis! Why have ten shirts for ten different purposes when a cleverly designed shirt can serve all purposes? The idea behind prose is to produce versatile clothing and thus promote a more sustainable use of clothing. Being free to do whatever you want with just one shirt. Write your story with prosA! Prosa is borrowed from literature and refers to free, independent writing or narration. This idea is the guiding principle behind the conception of our textiles: versatility – independence – unlimited! To feel good “in your skin” is essentially tied to what we wear on this skin. Due to its natural properties, merino wool supports all situations of life. Thanks to its high quality, it is super soft and guarantees a unique, comfortable feel and maximum comfort. The combination of uncompromising functionality and a clever, versatile design is based on an outstanding material – merino wool. This natural product inspires with its phenomenal properties and abilities. Combined with the highest quality standards, this results in Prosa clever clothing. Clothing that is not designed for a specific purpose, but entirely tailored to the requirements of the wearer. Clothes that can be worn everywhere and at any time and therefore do not get tainted after a single use in the wardrobe. Prosa cannot be limited – whether in everyday life or for an adventure! Prosa is always there for you: at work or in your spare time, while hiking, cycling, climbing, bouldering, jogging or your next date, in the bar or in the club. Especially when travelling, Prosa has huge advantages. At Prosa we only use certified wool, which is produced and processed under good conditions and animal-friendly. The idea of sustainability should not only be reflected in our shirts, but also in our creative process. But Prosa is more than just that! Prosa is not only clothing but at the same time everyday helper, gadget and LifeHack! Smartphones are getting bigger and bigger, Portmonees are getting smaller, we always carry a lot of things with us that are never to be stowed in a trouser pocket or cause bulging pockets. 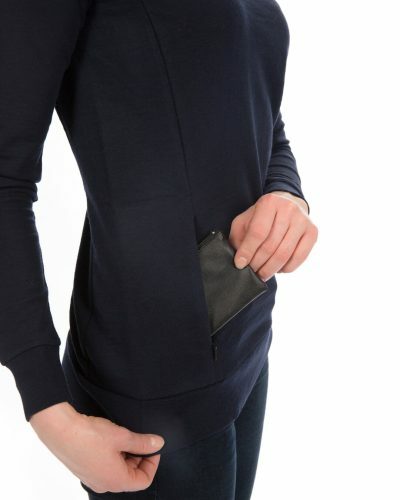 Prosa provides a solution with an invisible pocket construction. This includes your smartphone, your wallet, headphones while bouldering, your key while running, your boarding pass, money and other small things. Securely stowed and quickly accessible. Become supporters of our crowdfunding campaign and become part of Prosa. For the first we have a number of strongly reduced and limited Early-Bird offers that are guaranteed to be worthwhile. Our campaign starts in April on Indiegogo. Subscribe to our mailing list and stay up to date, we will inform you about the start and progress of the crowdfunding campaign, as well as about the promotions and offers.